I am a Stay At Home Mom. I really LIKE being a Stay At Home Mom. But sometimes I wonder; am I really contributing to the world just by doing laundry? People like to say that. There are no end of memes and quotes and LDS talks about the divinity and importance of Motherhood. And, although I have always thought it was divine and important work, I wasn't buying that any amount of laundry loads, Family Home Evenings, or meals around the table was literally changing the world. And then, I was reading the scriptures recently and began to read the story of the 2,000 Stripling Warriors. I have read this story many, many, many times. Trust me, I have. But for the very first time something became clear that had never struck me before. There had been much warring between the Nephites and the Lamanites. Finally, General Moroni and his Nephite legions won an important victory and took possession of the city of Mulek, a stronghold of their enemies. Moroni and his people spent the next few months repairing their fortifications and providing food for their families. During this time of preparation, and because the Nephites’ attention was on other things, the Lamanites were able to capture some of the Nephite cities in the south by the sea. 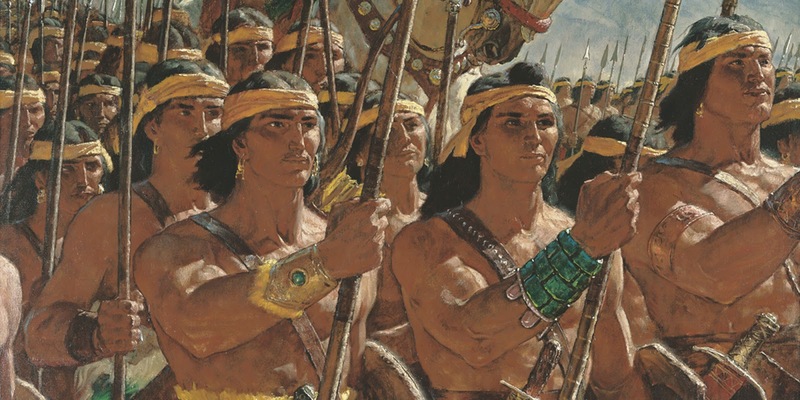 Then while the Nephites began to argue and scheme among themselves, the Lamanites became more bold and prepared to attack the larger cities of the Nephites. Seeing the desperate situation their protectors were facing, the people of Ammon (Ammonites)—those converted to the Lord by Ammon and his brethren—wanted to help their Nephite friends fight against the Lamanite armies. The prophet Helaman was grateful for their offer to fight, but he persuaded them that they must keep the oath they had made with the Lord to never again shed men’s blood. Altogether there were 2,000 of these valiant sons, and they asked Helaman if he would lead them in battle, to which he agreed. And in spite of their youth and inexperience in combat, the Ammonites proved to be good soldiers. Under the leadership of Helaman, whom they called “Father,” the striplings were successful again and again, and proved to be a great strength to the Nephite armies who had become weary with fighting. And that's when it spoke to my heart like it never had before. Their mothers were Stay At Home Mothers. Their people were at war. Those Mothers may have had many opinions about the wars and politics of the times. But what could they do? What could these mothers contribute? Maybe they felt closed-in and unimportant. But the years and years of teaching their families, sharing their testimonies with their children in moments that weren't grandiose or vitally important, made a difference. Maybe these Mothers had days just like I have. Days filled with endless crying and poopy babies, and vomit, and laundry. Maybe they wondered if these small details and daily tasks would ever mean anything. Maybe they even tried to wrangle their small children to sit still long enough to share what they believed about God. Maybe they were often weary and tired and impatient and wondered how any of this could ever be meaningful beyond the walls of their own home. But when their sons grew older and faced taking up arms in a way that would change their world and generations after them, the teachings of their Mothers, that if they did not doubt, God would deliver them, shaped the very course of history. I have not stopped thinking about this personal experience since it happened. I have had a renewed commitment to teaching my children within my home. Maybe there will come a time when I stand outside of my home and fight the injustices of the world (and if given that chance I will take it), but maybe there won't. I have come to understand that if I do my best to raise my children to be good people, who trust in God, that it's very possible that training up my children in the way they should go (Proverbs 22:6) could change the course of history. Thank you. It's a question I often have too. I appreciate your sharing your insights from studying the scriptures. Love the and we get from them. I've also felt that my most important contribution will be in teaching my own children... and other children in my sphere of influence. I love this. I needed this, thank you!